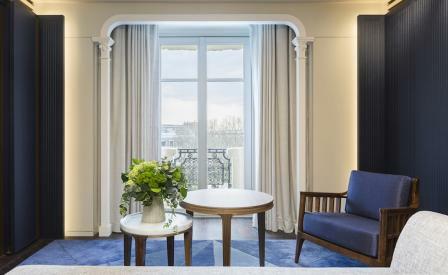 When the Lutetia Hotel first opened in 1910, it was the talk of town for embracing the then emerging art deco style, as much as for being a hub for Paris’s intellectual elite from André Gide to Matisse and Picasso who both took up residence there. Now after four years under the knife, the landmark hotel is emerging from a lavish restoration that has restored it to its former glory. Assisted by a team of skilled craftsmen, architect Jean-Michel Wilmotte’s firm has meticulously revived the building’s original details such as the stained glass windows, and the ceiling fresco painted by Adrien Karbowsky. This serves as a decadent backdrop for the understated interiors of the guestrooms which are revealed through tactile fluted wood panelling, brushed oak flooring, hand-blown Murano glass wall lights, and rich textiles in a creamy caramel, aubergine and blue palette.